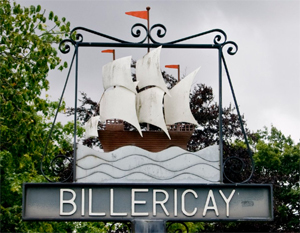 The Society was formed in the 1960's, primarily as an archaeological Society by a group of local historians who have conducted exploration at various sites local to Billericay. Their findings have been published since then, including a full archaeological report on Roman occupation in the area. Although modern regulations now prevent amateur excavations, they still look for possible evidence on any modern local developments, in which case attention is drawn to council archaeologists. Having ceased hands-on excavations, our interest is mainly centred on more Historic content where qualified speakers give monthly talks of local and national interest, including news of Archaeological sites where possible. These talks have proven most popular, drawing a good attendance from both members and visitors, where the latter are made most welcome. We also arrange visits to sites of archaeological and historic interest throughout the year, which provide a convivial means of extending our interests at reasonable cost. Our monthly meetings are held at The Fold, Arts Centre, located off Laindon Road, Billericay, where we meet on the second Monday of each month at 8:00 pm. Our Talks Programme shows the topics covered each month, feel free to join us as a visitor if you see any of particular interest, or you might consider becoming a member. We charge £3.00 per session for visitors, £12 per annum for individual membership, £22 for couples, and concession rates are £10 for individuals and £18 for couples.